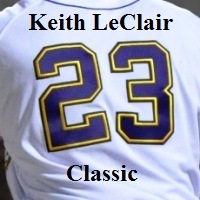 David Lucroy hurled five innings of three-hit ball and the East Carolina bats erupted for four runs in the sixth to help the Pirates finish unbeaten in the Tenth Annual Keith LeClair Classic with a 5-1 victory over New Mexico State Sunday afternoon. A freshman righthander making his first start, Lucroy matched Aggies starter Michael Ormseth frame for scoreless frame until giving way to reliever Andy Smithmyer in the sixth. NMSU got to Smithmyer for a score in the top of the sixth on an RBI double by Kent Blackstone, but the lead was short-lived as the Pirates responded with four runs on four hits and an error in the bottom half of the inning to take what turned out to be a decisive lead. The ECU uprising was highlighted by an RBI single by junior first baseman/designated hitter Chase McDonald, an RBI double by sophomore outfielder Nick Thompson and an RBI sacrifice fly by senior outfielder Jay Cannon. The rally gave the win to Smithmyer (1-1), who struck out four and surrendered a hit and five bases on balls in two innings. After a 1/3-inning relief stint by freshman lefthander Nick Durazo, junior designated hitter Drew Reynold took over the mound duties for the Pirates, fanning two and surrendering a pair of hits in 1 2/3 scoreless innings to close out the win and pick up his second save. ECU added an insurance run in the eighth on junior outfielder Dylan Brown's sacrifice bunt. Including Thursday's 8-2 win over Illinois in the KLC opener and Friday's 2-1 thriller over Boston College, the Pirates finished 3-0 in the annual event. Illinois had the second best record at 3-1, New Mexico State and Ohio were 1-2 and BC came up winless at 0-3. The Pirates will be back in action Tuesday with a 5 p.m. home game against Virginia Commonwealth. Records: ECU 2-3; NMSU 3-4. LOB - NMSU 13; ECU 6. 2B - Blackstone(2); Umphres, D.(1); Thompson, N.(4). SH - Paulson, M.(1); Reynolds(1); Brown(1). Loss - Ormseth, M. (0-1). HBP - by Ormseth, M. (Thompson, N.). Umpires - HP: John Haggerty; 1B: Junior Creech; 3B: Brian Kennedy. Start: 1:00 PM; Time: 2:40. Smithmyer faced 2 batters in 8th. Page updated: 02/24/2013 10:54 PM.